Team outing out for Belgrave with Alex and I both in attendance for Belgrave. Another relay thriller! 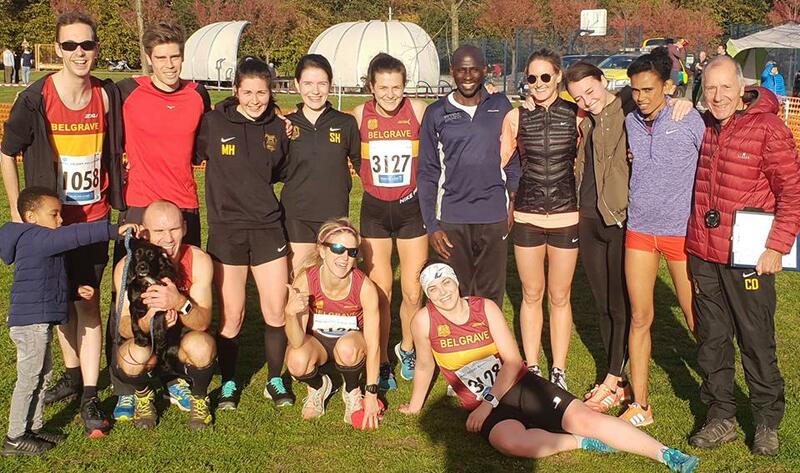 This time at Reigate with the Belles consolidating on our bronze at Wormwood scrubs 2 weeks, we flipped our order from the Scrubs and held Saron back until the last leg to catch a small gap I lost. I was on leg 2 and he was on leg 4 with the men needing a team of 4. l have always run well at this event and typically each year my 2nd cross country of the season and a firm favourite. A punchy 2.5 mile hilly race in the hills and some fast sections that you can pick up the sluggish legs from the hill climbs that start in the first 800m. First out was Keri Mack well known for her speedy 1500m so a long day out, she came around in 3rd place to handover to me and then proceeded to climb a few places into lead position until being overtaken in the last 1.5k but still retaining a massive lead on the 3rd place team. Then onto our last leg which was our speedy fireball Saron, she managed to gain back the lead and storm home with the fastest leg of the day and we came away with team Gold. The men also with Alex in the team managed to get a fine Silver but proving too hard to hold off the Dorking team who had some international level athletes. Great team spirit and day out at Reigate…. Next mission to get through a 22 miler tomorrow.